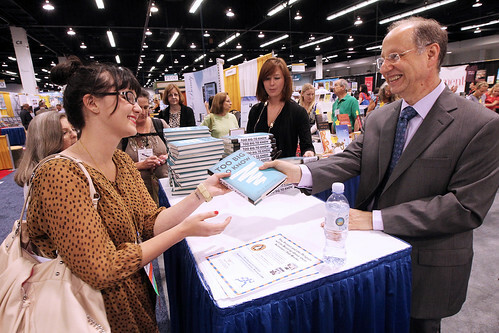 Just a quick recap of ALA Annual in Anaheim, for posterity and to prove I was actually there. I met David Weinberger! It was exciting, and I was awkward, and he signed a copy of his new book for me. I'm very happy about this. Looking forward to reading it. Also, his speaker session was pretty great. I especially liked his analysis of Reddit. Disneyland was the most un-crowded ever. We were there for only like two hours, three maybe, and we just walked on a bunch of rides (including Thunder Mountain, my fave) and saw the fireworks. Sessions on distance education librarianship and embedded librarianship. I took soooo many notes. Really helpful and inspiring for some of my short-term goals. The Philosophical, Religious, and Theological Discussion Group. There were ten people there, including me and another recent MLIS grad who also has his MA in theology from Fuller. It was really cool being in a small-group setting with people who actually do what I'd love to do some day. Plus they were super nice. Learning about Duke Divinity School's digitization project for American Methodism and churches in North Carolina. Super super interesting, and I got to talk to the guy who's heading it up (or was... I guess he got a job somewhere else). He's also involved in the ATLA's online open access journal, which he encouraged me to look into and think about submitting content for. Hanging out with my iSchool cohort friends. THE BEST. I'm so glad I had people there to spend time with (and split the cost of a hotel room with!). I had an awesome time in the company of these smart and wonderful people! Overall, the experience was overwhelming and tiring, but so informative and inspiring. I doubt I'll be able to make it to Chicago for next year's conference, but I'm glad I had the opportunity to go to this one, since it was so close to home. It gave me an insight into librarian culture and got me excited to be in the field all over again!